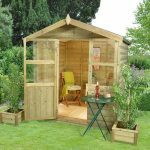 This is a beautifully designed wooden corner summerhouse with large and impressive looking windows and wide, light and airy double doors to make getting in and out nice and easy. It really would be ideal sitting in the corner of a garden and will make a real feature placed there. The windows are Georgian glazed in style and the wood is tongue and groove for a hard wearing and long lasting product. 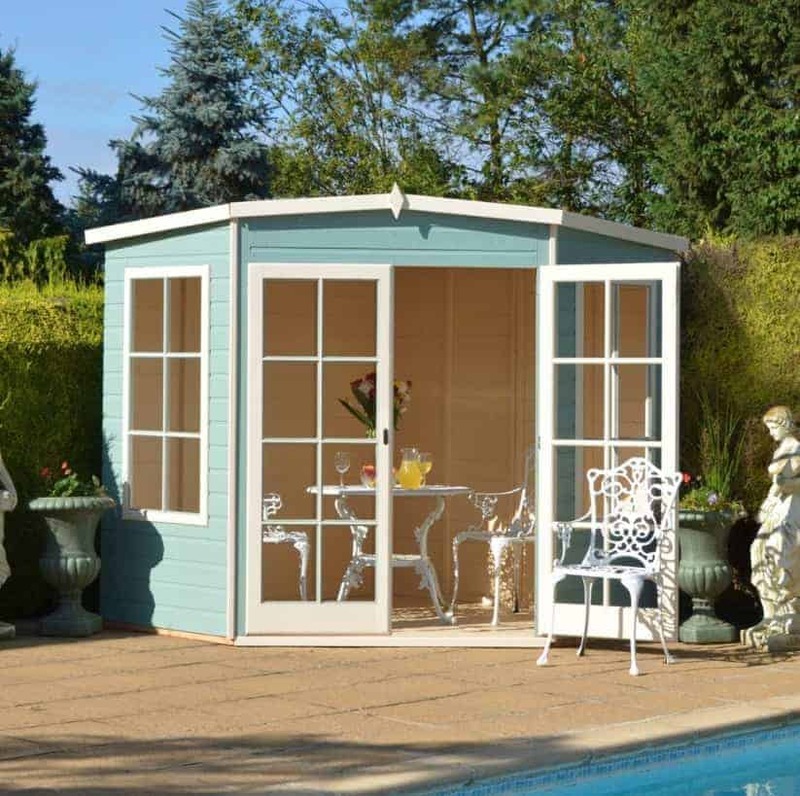 You won’t want to leave your stylish summerhouse as it’s the perfect place to escape to after a long and stressful day. This product is home delivered and assembled for you. 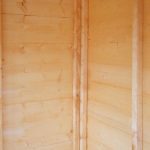 The tongue and groove shiplap cladding that makes the walls is backed up with a very impressive frame which is 34 mm x 34 mm. The combination of the wall cladding and this strong frame make this a summerhouse which is going to last for many years. 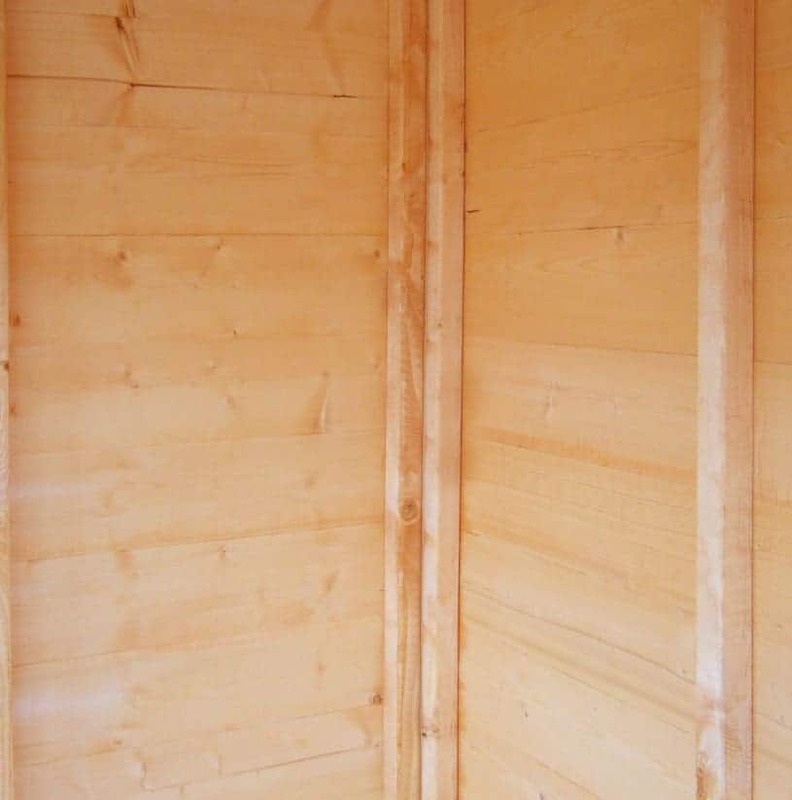 The flooring has been made with tongue and groove boards so that they can take a vast amount of weight and also so that they go with the design of the rest of the summerhouse. 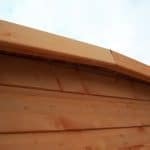 The pent roof is made to a very high standard and is going to prevent the rain from spoiling anything you have inside. 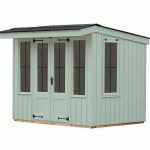 The Hampton 7X7 Shiplap Timber Summerhouse is a gorgeous looking corner summerhouse which with its elegant look will always be begging you to put down the mower and come inside and have a cold drink. We really love the design of this and while it has been clearly designed to go in a corner, we feel that it would actually look great no matter where you put it. The 7 x 7 size of this means that you have a decent amount, not a lot, but a decent amount of space to make use of and if you plan your layout right, we are sure that you will be able to really lay this out just the way you want. The headroom in here is fine and at 6 feet 9 inches will see you be able to walk around comfortably inside of here. We really love what Shire do with the roof on their corner summerhouses. They use a pent roof which slopes to the back and from the front you really cannot see it all that much and we actually really like that. The solid sheet boards are covered with roofing felt, but due to the lovely decoration they have along the front, you will struggle to see this and that is actually something we like. The roof is strong and thanks to the pent design, water is going to roll of the back and stay out of the summerhouse. 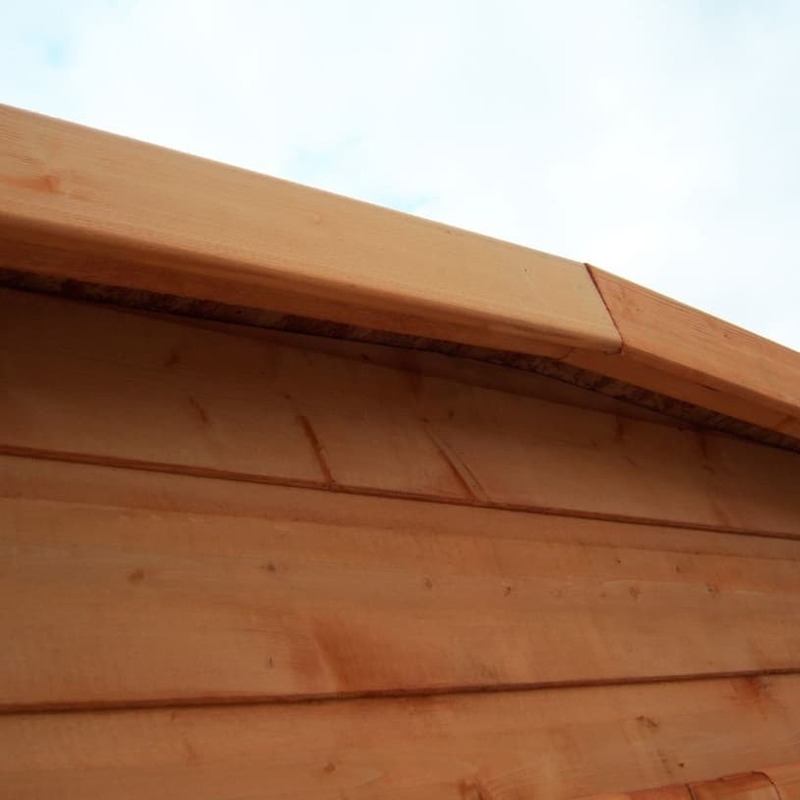 A huge part of what gives this its fantastic looks is the tongue and groove shiplap cladding. While this cladding certainly has a very pleasing to the eye type of look it is also made very well. This cladding will not allow any water at all to sneak its way inside. It is strong and thick enough that if you do have kids who like to play football in the garden then the walls can handle this and much more. Shire have been impressing us a great deal with the frames that they have been using in their lower cost summerhouses. 34 mm x 34 mm framing is going to make this a structure that has a very solid and long lasting feel to it. We know that a frame is not something many people will be all that excited about, but we can tell you that the frame is going to be one of the major reasons as to why you are going to get many years out of this. Drop dead gorgeous tongue and groove boarding has been used for the flooring and trust us when we tell you that this is some very high quality flooring. The amount of weight this can handle is quite incredible. The design of the floor goes very well with the wall cladding which is something we of course really like. Like anything else the good folks at Shire make, the Hampton 7X7 Shiplap Timber Summerhouse will be given a basecoat treatment which will give it a short term protection. A full coating of wood treatment should be applied within a couple of weeks if not sooner and then once a year after this. All of the wood is covered with a very generous 10 year anti rot guarantee. 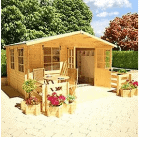 This guarantee though, we must tell you is only going to be valid once you have treated the summerhouse. The large double doors are the most eye catching feature of the summerhouse. They are predominantly made with toughened glass, supported with high quality hinges and close securely with a hasp and staple. The large size of them also mean that getting things that are large is very easy. So if you want to put a foosball table in here, you will have no trouble at all. We are not saying your other half will let you do this, but in theory the actual table would fit through the doors easily. There are two more windows on the summerhouse with one each side of the door. These are a bit smaller than the ones on the door, but they are made with that same toughened glass so they are very strong. These are fixed windows, which we will be honest is a little bit disappointing, but at the end of the day for this kind of price we are really not all that surprised. A padlock will be needed to ensure the summerhouse is securely locked up at night and when you are away. The doors do close very well on their own, but there is no included locking mechanism with it, hence the need for a padlock. Still adding a padlock is not hard at all so please do not see this as a big deal. The windows are quite large so this is a very come and have a look inside here type of summerhouse. Of course if you add some blinds or even curtains then you are going to be able to stop people looking inside and give yourself a little bit more privacy when you are trying to relax after a long hard day. Shire are not offering any customisation options with this, but you could always give it a coating of coloured paint to give it a bit more of your personal style. It is worth us mentioning that you can get wood treatment that is coloured these days so that is a way to treat the wood and change the look of it at the same time. Getting a cheap padlock or something to cover the windows up a little bit is all you need to think about when it comes to extras. 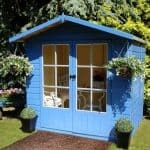 Shire know how to make high quality products at great prices and this is a summerhouse which is of a very high quality. You are going to be able to have drinks, eat dinner or even just hide away from the other half when you have done something bad in here for many years. This is down to the high quality materials and impressive design. 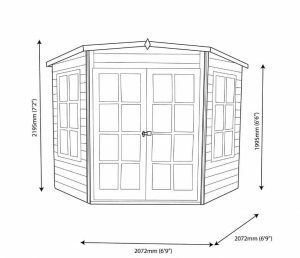 This is not a large summerhouse by any stretch of the imagination, but we feel the corner design of this if you are clever will give you more space than you would think. Back away from the tool box, put down the hammer and pick up a glass of wine instead as this summerhouse comes with an installation service. 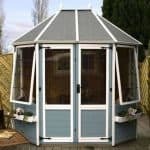 The price at a glance may seem a little on the high side, but when you consider that there is an installation service included, we actually feel this is a very fair priced summerhouse. 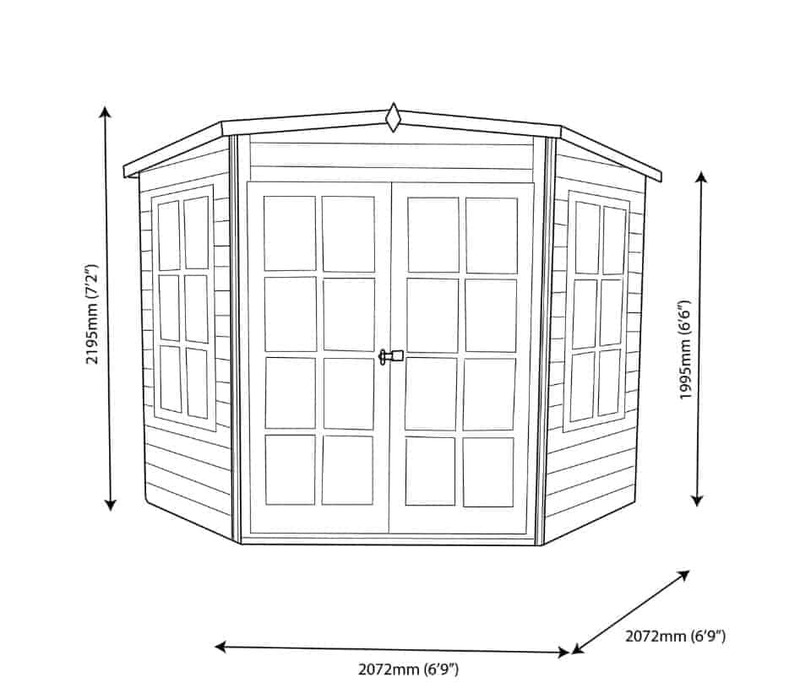 Final Thoughts: We really appreciate the corner design of the Hampton 7X7 Shiplap Timber Summerhouse. 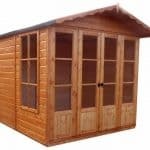 It gives it a really different type of look from all the other summerhouses that are out there and it makes it stand out in a very good way. The overall design is something that impressed us a great deal and as well as being attractive, you will be able to use this for a long time thanks to the strong design of it. 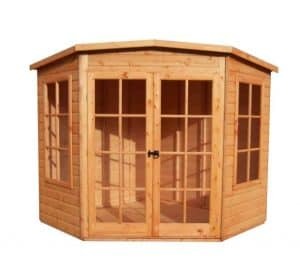 The price is more than fair and as far as the lower cost summerhouses go, we feel that this is one of the more high quality ones out there and of course it comes with an installation service which just sweetens the deal that little bit more. With all our friends flying out to exotic locations in the summer, it didn’t seem fair for my family to spend the vacation at home just because my husband couldn’t get off work. I was getting rather tired of staying in our house all day. I needed a change of scenery, and while we considered spending a week in a hotel, we eventually decided that it was a temporary solution to a much more permanent problem. My husband agreed to buy us a summerhouse that could be installed easily at the edge of our estate, and we settled on the lovely Shire Hampton Corner Summerhouse because it seemed just perfect. True to its name, it really does make us feel like we are vacationing in the Hamptons, and not at the end of our garden. The pastel shade, the glazed windows, and the beautiful design is a lovely escape from the monotony of everyday life. I was searching summerhouses on the internet, and when I came across this one, all I could say was “wow”. It was beautiful. I loved the style of the Georgian Glaze. It is maintenance free – who doesn’t like that??? I know that is a winner quality with me. There is a lot of windows which is good to let the sunshine in. It’s not very good to stay in a gloomy, dark place. I don’t think the price is that bad for all that you get with this shire hampton summerhouse. It is spacious for what you will need it for – which in my case is relaxing. I can sit a table in there with a couple chairs. I also have a small portable refrigerator. I like to spend a lot of time out there. It’s stylish, so I don’t mind it in my back yard at all.